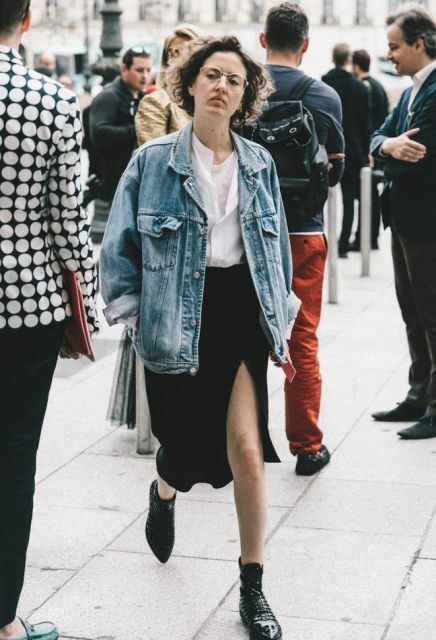 From my point of view, a loose or oversized jacket is one of the most popular jackets nowadays. So every fashionista should have at least one and make stylish and creative outfits with it. 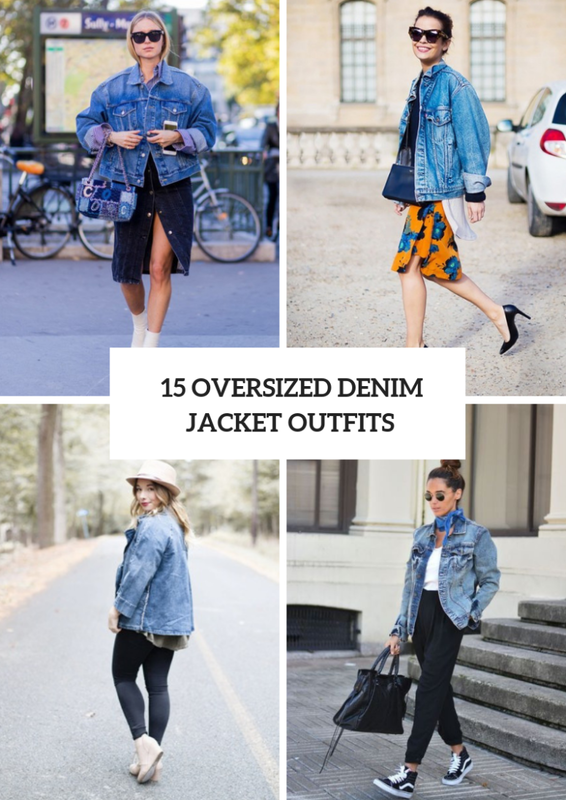 Today I want to pay your attention to oversized denim ones cause they will be great additions for spring and summer looks. You are free to choose a classic blue jacket or eye-catching embellished or embroidered one. Do you want to find a perfect outfit idea for yourself? Then scroll down and enjoy! If you wanna create a relaxed outfit, then we have some ideas. First of all, you can take a white loose button down shirt and pair it with a loose denim jacket, striped wide leg trousers, a marsala leather clutch and white and black sneakers. Secondly, you can choose a white shirt and combine it with a acid wash oversized jacket, gray cuffed pants, sunglasses and light gray sneakers. 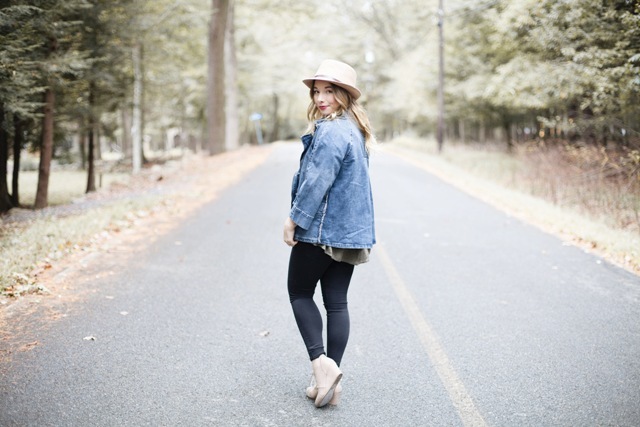 And, thirdly, try to repeat a look with black leggings, a beige hat, a blue denim long jacket, a gray t-shirt and beige shoes. Wanna something eye-catching? Then you can choose a burnt orange wrapped knee-length skirt with blue flowers and combine it with a black sweater, a denim oversized jacket, sunglasses, a navy blue leather crossbody bag and classic black pumps. 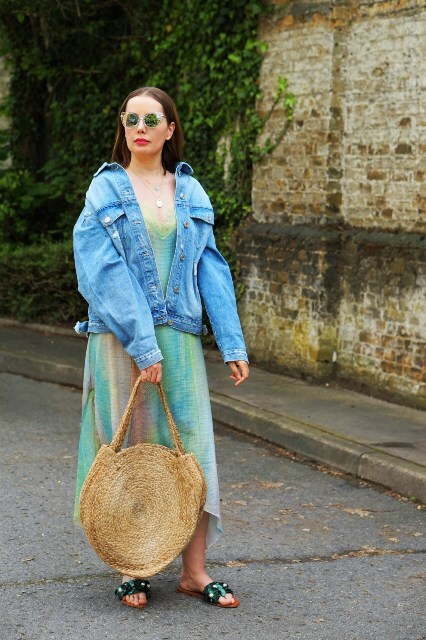 Or you can take a colorful maxi dress and mix it with a jacket, a big rounded bag and flat shoes. If you are looking for casual but feminine outfit ideas, then you should try to repeat a look with a navy blue oversized sweater, a printed skirt, lace up shoes and a jacket. Or can combine a navy blue midi dress, an oversized jacket, a black leather backpack and mules together.